"What's the use of having a war if you don't learn from it?" The speaker is Alec Stiles (Richard Widmark), a menthol-sniffing asthmatic in a snap-brim hat who's nailed down the organized-crime franchise for a burg named Center City, and who runs it "scientifically," using methods he picked up in uniform during WWII. He can even tap into the databanks of the FBI. Which, by coincidence, is gearing up to bring his mini-crime wave to an end. Street with No Name invites us to sit back and watch both sides deploy their methodologies at each other. From the moment undercover agent Gene Cordell, alias George Manly (Mark Stevens), drops into the lair of ruthless mob leader Alec Stiles (Richard Widmark), you wonder if he will ever get out alive. Manly's mission is to, while becoming a target for same, infiltrate the gang and discover how suspects are framed, arrested, released and murdered. Widmark plays no clay-pigeon role. He is sharp and hot on the heels of an inside informant and knows what to do when he finds him. Based purely on reviews of others, THE STREET WITH NO NAME was on my wish list for months. It fulfills a viewer's desire for a suspenseful cops-and-robbers movie in a DRAGNET style narrative. The crime lab investigation techniques have not dated well but I generously offer a 4-star rating (rounded up from 3.5). Just don't compare the technology with modern forensics. If you like mobster movies, sink down in your favorite chair, wait for the fireworks, and wish Manly the best. "The Street with No Name" was among the documentary-style dramas that came into fashion in the late 1940s. This docudrama was inspired by a true story, "adapted from the files of the Federal Bureau of Investigation". In keeping with the documentary style, it was filmed in some real locations and features real FBI agents in small roles. Cinematographer Joe MacDonald also did the true crime docudrama "Call Northside 777", which I think is a better film, but his work on "The Street with No Name" is also excellent. MacDonald uses a combination of low-key "noir" lighting and high-key documentary lighting to bring both sensibilities to the film. "The Street with No Name" distinguishes itself, in my mind, from other docudramas of the era by its binary nature and by constant allusions to the gangster films of the 1930s. The film is part police procedural and part docudrama. It vacillates between the two, but they are not integrated. The manner and appearance of the criminals are straight out of the 1930s. In fact, if someone were unfamiliar with the technological limitations of the 1930s, he might assume that "The Street with No Name" was made then. When 2 robberies result in 2 murders within 5 days in Center City, law enforcement fears a bona fide crime wave perpetrated by organized gangsters. Inspector George Briggs (Lloyd Nolan) of the FBI is given the responsibility of finding the culprit and breaking the gang. When a suspect is framed for the murders, arrested, released, and then found murdered, Briggs decides he needs an undercover agent to infiltrate the operation. Agent Gene Cordell (Mark Stevens) poses as a drifter named George Manly and circulates in the skid row area. His performance in the boxing ring catches the eye of crime boss Alec Stiles (Richard Widmark), who proposes that George work for him on an upcoming heist. Meanwhile, it has become clear that Stiles has an informant in the local police department. Agent Cordell must gather evidence against the gang and find the police mole before he is found out himself. "The Street with No Name" is similar to "T-Men", which was released the same year, in that both are docudramas based on real cases involving undercover FBI agents. But, beyond that, the two films couldn't be more different. "T-Men" is a true film noir that may be interpreted as laudatory towards the FBI or cynical, as the agents are consumed by the brutality in which they immerse themselves. "The Street with No Name" is propaganda for J. Edgar Hoover's FBI. It begins with Hoover's proclamation that the nation is in the midst of an organized crime wave at the hands of amoral gangsters who would unleash indiscriminate violence on the populace, eventually affecting 3 out of 4 Americans, unless the agency swiftly put a stop to it. I believe the implication is: Unless the FBI were given a free hand. This film was released in 1948, a decade after the crime wave. "The Street with No Name" was trying to create public support for its policies by generating paranoia. Then it shows us how the modern FBI will triumph over crime by touting the efficiency and sophistication of the FBI for the rest of the film. I find Hoover's rabble-rousing distasteful, but the dramatic aspects of "The Street with No Name" are engaging. Richard Widmark is looking very sharp as the compulsive, intense Alec Stiles, a man who is in control of his business but not not entirely in control of himself. Widmark was a wonderful character actor who brought an intensity and candor to all of his "noir" roles -which makes me wish he had more screen time here. Barbara Lawrence has a small but memorable role as Stiles' wife Judy, who can take abuse and dish it right back. "The Street with No Name" is a solid police procedural/gangster film -that might have been improved by concentrating more on characters and less on propagandizing. The story was transplanted to Japan and remade as "House of Bamboo" in 1955. The only Washington bureaucrat I've ever heard of who could strike fear into the hearts of gangsters, suspected Commies and U.S. presidents alike was J. Edgar Hoover. Even when he wasn't wearing a house-dress while cleaning his home, he must have been a fearsome presence. The Street With No Name is, like The House on 92nd Street filmed three years earlier, a semi-documentary hymn to the house that Hoover built, reverently produced by Darryl Zanuck and complete with the equivalent of organ music (a stirringly patriotic dum-de-dum film score) and a heavenly chorus (one of those stentorian voice-overs that Reed Hadley used to do so well). However, unlike The House on 92nd Street, which now seems dated and cringingly naive, The Street With No Name contains elements that hold up fairly well...but you have to get past all that FBI worship, which is difficult to do. Alec Stiles runs a smart, murderous gang which has moved from numbers to gambling to heists, and along the way has started to kill those who get in its way. Gene Cordell is an FBI agent who is ordered to go undercover, work his way into the gang, earn Stiles' confidence, and then blow the whistle. Stiles is no dummy but Cordell, posing as a tough drifter named George Manley, pulls it off. Life gets dangerous for Cordell when an informer in the police department tips off Stiles. Stiles has to call off a major robbery at the last minute, and then sets out to identify the rat. He doesn't know it's Manley, but he knows it has to be someone in his gang. It all comes together in a tough, murderous shoot-out. Sound a little like House of Bamboo? It should. House of Bamboo, located in Tokyo and with Robert Stack in the Cordell role and Robert Ryan in Stiles' shoes, was based on The Street With No Name. What's good about The Street With No Name? Mainly, the look of the film. Most of it was shot in grubby Los Angles locations, often at night, with damp streets and harsh lighting. The crummy, second-floor hotels, the sweaty boxing center (you can pay 25-cents and watch two losers pound each other for three rounds), the deserted factory, the night-time ferry building...all look awful, which means they look great. Alec Stiles' wife, played by Barbara Lawrence, is a fine noir dame, full of whiny, petulant sexiness. Two members of Stiles' gang also make an impression, Donald Buka as Shivvy, Stiles' right-hand man who never seems happy and prefers a knife, and Joseph Pevney as Matty, always grinning, who loves blondes and would turn in his own mother. Richard Widmark as Stiles gives the movie its energy. This was Widmark's second movie, a year after creating a vivid Tommy Udo in Kiss of Death. There's a good deal of Udo's menace in Stiles, but Widmark makes him a lot smarter. We'd be negligent if we didn't also give credit to Alec Stiles' nasal inhaler. Stiles has a thing about fresh air and germs; he uses his nasal inhaler the way some children use their fingers. But then there are the not-so-good things. The movie is constantly interrupted with scenes that show how steadfast and resourceful the FBI is, especially with all their new-fangled technical resources in Washington. Every time we stop to see these FBI resources in action (ordered by Lloyd Nolan, reprising his role as George Briggs from The House on 92nd Street), the movie stops, too. The voice-over and the grandiose FBI music have the same effect. Another major defect is Mark Stevens as Gene Cordell/George Manley. Stevens was a good-looking B-level leading man, but a limited actor without much screen presence. This is, in my view, the same fatal flaw in House of Bamboo when Robert Stack was cast as the good-guy tough guy. Neither actor is believable. They drain tension. Fortunately, Widmark and Ryan by the power of their performances still make the two movies interesting. I can't think of too many actors who were able to parley creepiness into major leading-man stardom. Widmark, with his skull-like face and easy giggle, is not a guy I would have bet on to be a serious leading man for the next 25 years. It shows, I suppose, that even in Hollywood talent sometimes counts for a lot. The black-and-white DVD transfer looks just fine. There is a commentary I didn't listen to by James Ursini and Alain Silver, identified as film historians. If you're a noir buff you might want this one, but I'd suggest renting it first. Richard Widmark plays cerebral and hypochondriacal Alec Stiles, boss of a crime syndicate in metropolitan Centre City. Stiles, an up and comer in the world of crime has orchestrated two capers that have resulted in two deaths using the same pistol as the murder weapon. FBI investigator George Briggs played by a no nonsense Lloyd Nolan, recruits agent Gene Cordell played by Mark Stevens to infiltrate Widmark's gang. Stevens eventually gains Widmark's confidence and becomes a member of the gang. He soon learns that Widmark has a stoolie in the local police who is able to access FBI reports making life dangerous for Stevens. This review is for the 2005 20th Century Fox DVD release. This movie has a very simple story line. A criminal gang is under investigation for two murders during separate robberies. The gang is later infiltrated by an undercover FBI agent. It has story narration and uses actual FBI film footage and late 1940's lab techniques to give the film an authentic look. The well-written plot held my interest from start to finish and had a sufficient amount of dramatic and suspenseful scenes. The two main characters: Mark Stevens and Richard Whitmark have great screen appeal in this movie. I wish there was more of Barbara Lawrence. I also liked the setting: the skid row part of a major city with shots in places like a seedy hotel, an arcade, a pool hall and a boxing gym. My only minor criticism of the film is that it seemed too business-like in the way it was presented. As for the DVD, the image quality is overall excellent but far from perfect. I did notice on occasion a top-to-bottom hairline scratch on the film negative. I barely noticed it for a very brief period of time in just a couple of scenes in the first part of the movie, but then there was a segment near the end where it lasted for at least a full minute and was rather distracting. The film also lacked the true noir look. The black and white tones seemed a lot more washed out than the typical darker look one would expect for a noir film, but the film is still very watchable and entertaining. Overall, if you are classic crime noir fan of the late '40's, you will not be disappointed in this film. Once you get past the self-congratulatory opening minutes, which are straight out of the FBI public relations office, this movie settles into a pretty involving and creepy gangster movie. In fact, it almost feels like the mom-and-apple-pie stuff at the outset was placed there to help get the dark, violent stuff that follows past the censors. The DVD features a fairly clean and sharp print of the film (though some wear and tear is occasionally evident), an engaging commentary by two film historians, the trailer of the film, and a nice selection of other trailers from Fox's film noir collection. "Gangsterism is returning," FBI agent George Briggs (Lloyd Nolan) says at one point in William Keighley's THE STREET WITH NO NAME (1948). Maybe `intones' is a better word to use. Back then the FBI did a lot of intoning, and if ever a federal agency owned a movie the FBI owned THE STREET WITH NO NAME. It's their house; I `spose they can do all the intoning they want. Anyway, the gangsters are back, sporting a spiffy new `scientific' method and fronted this time by the psychotic hypochondriac Alec Stiles (Richard Widmark). We first see Stiles when he's wearing his business clothes - floor length coat, fedora, and crook's mask - while heisting a swank nightclub. The first thing we see him do is shoot a woman in the back. It's better than pushing a wheelchair bound woman down a flight of stairs, I suppose, but not a whole lot better. When Stiles' gang knocks over a bank, it becomes a federal matter, an... FBI matter. The first and last image, before and after the title cards run, is the seal of the Federal Bureau of Investigation, accompanied by trumpets and fanfare. A couple of teletypes clatter out during the movie, signed by J. Edgar himself. This doesn't mean a movie will necessarily be bad, and THE STREET WITH NO NAME is not a bad movie, but it severely limits its options. The bad guys must be vermin and, above all, the Bureau cannot be embarrassed. Mark Stevens plays the highly trained and ultra-competent FBI agent who goes undercover to infiltrate Stiles' gang. To do so, he plants himself in the seedier side of the town of Center City, with the wonderful John McIntyre along as a conduit between Stevens and chief Briggs. From the informal dialogue on the commentary track between film historians James Ursini and Alain Silver, both film-noir experts, we learn that the no-name street so much of the action takes place on, the street loaded with arcades, greasy diners and flop houses, was Main Street in Los Angeles. Director Keighley and cinematographer Joe MacDonald obviously fell in love with the great mounds of trash, the dented garbage cans and battered brick walls they found on location. They linger lovingly over it, now and then jarringly pulling us away from the dirt and grime to visit the desk-bound drones of the FBI, where the lab coat crowd hover over their densiometers and spectrographs, ballistic microscopes and oscilloscopes. I'm not sneering - at least, not all that much. With its great use of locations and natural lighting THE STREET WITH NO NAME is great to look at. The story isn't all that bad, either. Stevens does what he can with a character whose first and last duty is to not embarrass the Bureau - those FBI seals and notes from J. Edgar don't come free, you know. McIntyre, who'd look rumpled in a freshly pressed tuxedo, at least looks progressively seedier as he spends more and more undercover time on Skid Row. Widmark is appropriately sinister and ruthless. Solid entertainment, strongly recommended. A fascinating and challenging subcategory of film noir is that of documentary noir, in which the elements of documentary filmmaking is blended with the shadowy world of mystery encompassing noir as a basic genre. "The Street With no Name" directed by William Keighley is a superb 1948 Fox film that ideally meshes the best of both worlds for a superb result. The title was taken from a then current saying describing the turbulent post-World War Two crime scene. Sophistication had caught up with brute strength as gangsters formed formidable organizations in which the temptations of bribery were employed to get people in the world of law enforcement to provide necessary tip-offs, enabling them to achieve greater success in their enterprises and at the same time to eliminate detection. These well-organized enterprises were said to be akin to streets, but under the prevailing codes of silence streets bearing no names. The story begins with FBI agent Lloyd Nolan selecting one of the best and brightest of the current new agency crop to assist him in nailing a successful gang run by shrewd and fierce Richard Widmark, just one year after his triumphant film debut as the sadistic Tommy Udo in "Kiss of Death." The character Widmark plays in this film, Alec Stiles, is every bit as ruthless as Udo, but much craftier. He successfully co-opts an operative in the local mayor's office to provide him with needed information on friends and enemies so he can enhance his strangle hold on the local crime scene. Lloyd Nolan selects Mark Stevens to show up in town as a drifter and attract Widmark's attention with the idea of being asked to join his gang. One young gang member who befriends Stevens is future director Joseph Pevney. Stevens projects a demeanor of cocky confidence as he visits the local boxing gym that the FBI knows is owned by and operates as headquarters for Widmark. He chides a local fighter and his trainer to coax him into a sparring session. When Stevens, someone the mob is convinced will get his head knocked off in the ring with a seasoned professional boxer, holds his own and demonstrates some nifty moves, he in the process impresses local crime boss Widmark. From there it is just a short time before Stevens is asked to join the gang. From there the plot intensifies and interest increases as Stevens funnels information to the FBI while Widmark is apprized of what is happening by his inside man in the mayor's office. Tension builds as the audience wonders whether Stevens will be able to pull off the feat of gaining enough information on Widmark and his enterprise to enable the FBI to close it down or whether the wily mobster will catch on, aided by his contact. Lloyd Nolan has not allowed Stevens to function on his own. For protection he has placed agent John McIntire in the hotel directly across from the one where Stevens stays. As things heat up for Stevens the same applies to his colleague McIntire. Made with the full cooperation of the FBI, "The Street With No Name" was the second in a series of Fox produced paeans to the law enforcement agency. The first, "The House on 92nd Street" from 1945, was a trend-setter, introducing documentary touches to the crime drama. Lloyd Nolan appears as an agent named Briggs in both films and his billing in "Street" suggests confusion on the studio's part concerning the importance of this recurring character. On screen, Nolan is billed above the title immediately after Stevens and Widmark, and his name appears in the same sized type. 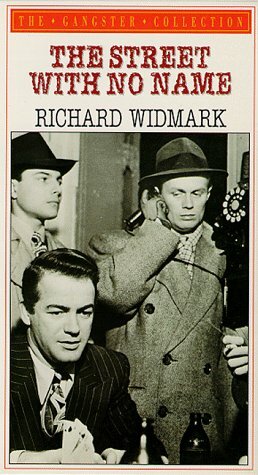 On the film's poster, only Widmark is prominently featured, suggesting that "the star discovery of 'Kiss of Death,'" as he is described in the trailer, was the primary draw. Though inexplicably forgotten when the American Film Institute compiled its list of the greatest heroes and villains, Widmark created as much of a sensation in 1947 with his cackling killer, Tom Udo, in the Henry Hathaway directed "Kiss of Death," as Anthony Hopkins did as Hannibal Lector in 1991's "Silence of the Lambs." Most notable for the scene in which Widmark ties an old woman into her wheelchair, then sends her sailing down a flight of stairs to her death, "Kiss of Death" revived the gangster genre and may have kick-started Cagney's return to villain roles in "White Heat" in which his explosive Cody Jarrett bore some similarity to Widmark's giggling psycho. Widmark's giggle is only fleetingly heard in "Street" but his character, Alec Stiles, has his own eccentricities. He grows violent at the sight of an open window and always complains about cold. It's freezing in here he yells, as he slaps a maintenance man who left his office door open when mopping the floor. "The Street With No Name" fits somewhat uncomfortably into the noir category. It has many touches that bring to mind the best of the genre including its location filming, rainy city streets, and exceptional cinematography by Joe McDonald whose credits include Elia Kazan's 1950 noir "Panic in the Streets." Some scenes effectively appear to be lit only by flashlight or, when Stevens meets Nolan on a nighttime ferry, by a cigarette lighter. But the film strays from noir genre with its overly zealous portrayal of the FBI as an infallible organization so heroic its armor shines bright enough to uncover evil in the darkest, most secret places. As the camera follows agents in their clean, brightly lit offices, comparing the bullets used in two separate murders or searching through files in scenes filmed in actual FBI locations, the accompanying music is so upbeat, you almost wonder why director William Keighley didn't ask the special-effects department to manufacture halos and angel's wings for the agents, so supernaturally pure are they depicted to be. At several points in the film, agents are shown awaiting messages on a teletype machine from bureau director J. Edgar Hoover. When the messages arrive signed "Hoover," we are probably meant to feel as though the agents are Moses while Hoover is God delivering something on the order of the Ten Commandments. Today, of course, Hoover's image is not nearly so pristine. More than anything, the saintly portrayal of Hoover and the FBI dates "The Street With No Name" and pushes it to the margins of noir, a genre that rarely portrayed characters untainted by crime or corruption even if they were on the side of law and order.